There's no need to set a current or choose a particular port. Charging speed can be controlled by the resistance within the cable, get devices charged with the fastest possible speed all the time. By using smart circuit protection, temperature control, premium design and other basic protections, ensuring complete safety for you and your devices. ♕ 【CHILD SAFE DOOR】 Each plug has plastic inserts that guard against probling children littler fingers or objects from dropping into the holes and creating a shock hazard. ♕ 【SPACE SAVING】 Allows room for large block space outlets. And it is perfect solution for charging 9 power-hungry devices simultaneously and eliminating a bunch of chargers. ♕ 【GOOD QUALITY GUARANTEE】 Made by fireproof ABS plastic and PVC copper cable, guarantee charging security and overload protection. 24 months warranty and 24 hours friendly customer service. 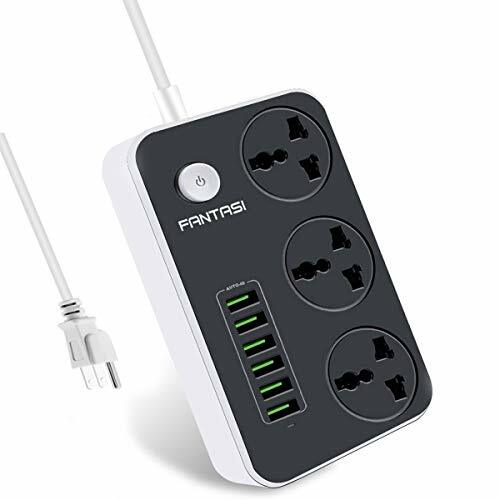 If you have any questions about this product by Fantasi, contact us by completing and submitting the form below. If you are looking for a specif part number, please include it with your message.